Parallels on Tuesday announced an update to its subscription-based Parallels Access remote desktop app, adding new gestures and controls to support operation on smartphones like Apple's iPhone. With the latest Parallels Access version 2.0 for iOS, the software firm best known for its virtualization software has made its iOS remote control app universal. Parallels first launched the app as an iPad-only title in August 2013, offering a new way to interact with Mac and Windows desktop applications on Apple's tablet. Unlike other apps, Access allows users natural navigation through iOS gestures, including taps, swipes and pinches. Along with iPhone support, version 2.0 now features the ability to switch screen resolutions, wake a remote computer from sleep and register or login via a connected Facebook account. In addition, Parallels includes a new file browser that offers access to files stored on a target computer. Finally, Access now accepts input from a controlling device's microphone, a nice addition for smartphones with limited screen real estate. Bug fixes and stability improvements are also included. 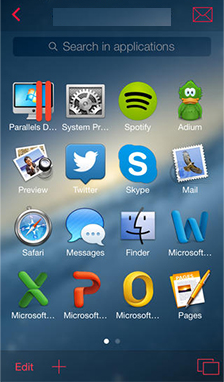 Those interested can try Parallels Access for free for two weeks after downloading the app from the App Store. After the trial period, subscription pricing starts at $19.99 per year to connect to up to five computers. A two-year subscription comes in at $29.99, or a 33 percent discount off one-year pricing.